Normally, employers must give notice, or pay in lieu thereof, when they terminate an employee. This is because, more often than not, employees are terminated without cause. A company could be downsizing or office personalities are clashing and an employee needs to be let go to strike a balance in the workplace. Even if they mess up on the job, many employees are given termination notice because of the difficulty in proving that a termination was brought on by the employee’s behaviour or performance. If an employer finds just cause to terminate an employee, the employee will not be entitled to notice of dismissal, termination or severance pay. Additionally, employees who are terminated for cause may not be eligible to collect Employment Insurance (EI) benefits and will likely find it more difficult to find new employment than if they had been terminated without cause. What Is Considered Just Cause For Dismissal? 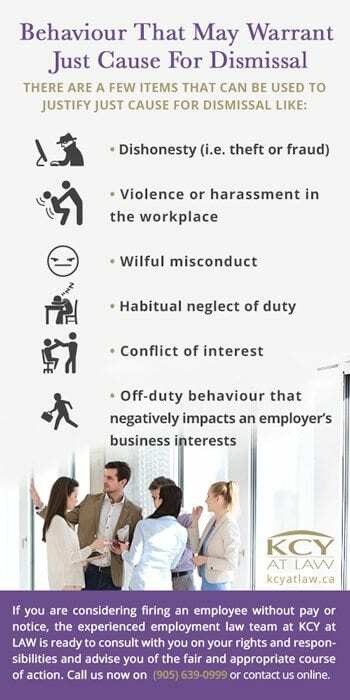 If an employee has been guilty of serious misconduct, habitual neglect of duty, incompetence, or conduct incompatible with his duties, or prejudicial to the employer’s business, or if he has been guilty of wilful disobedience to the employer’s orders in a matter of substance, the law recognizes the employer’s right summarily to dismiss the delinquent employee. Let’s break that down. Just cause for dismissal arises when an employee is guilty of wilful and significant misconduct, neglect of duty or disobedience. It requires that an employee go against their contractual obligations to their employer or behave in a way that is damaging to the employer’s business. It is not enough for an employee to mess up on the job. Accidental poor work behaviour is not the same as wilful or deliberate misconduct. The employee’s actions or omissions must demonstrate deliberate disregard or even open hostility to the employment terms set out in their employment contract to justify dismissal. When courts are deciding if termination for cause is justified, they always look for context. They will examine the extent, nature and circumstances of the alleged misconduct to determine if the punishment fits the crime. Factors considered include the employee’s position in the company (i.e. his or her seniority and responsibilities) and the employer’s workplace policies, procedures and standards. It is essential that employers hold all employees to the same standard. Occasionally condoning an act makes it much more difficult to later fire an employee for conducting it. It is up to the employer to prove that a termination was for cause. Doing so is often complicated. First, an employer will have to prove that fireable behaviour occurred. To do this, employers should be careful to document misbehaviour and the disciplinary measures used in response. The employer must further prove that the employee’s actions – or lack thereof – were in contravention to their employment contract. They must prove that the employee behaved in such a way that it damaged the employment relationship beyond repair. If an employer cannot demonstrate they had cause to terminate, they will be ordered by the court to pay damages to their former employee. Disobedience or insubordination can also be cause for termination. Insubordination may involve derisive, abusive, contemptuous behaviour towards a superior. Disobedience is the deliberate refusal to follow reasonable and important orders that are within the scope of an employee’s contractual duties. Usually, employers must have at least a few documented incidences to justify terminating an employee for disobedience or insubordination. What if your employee is just plain terrible at their job? Can you fire them for being incompetent or negligent? The answer is ‘yes’ but this can be tricky. When it comes to firing an employee for their incompetence or negligence, the employer must make the employee aware of their misconduct; let them know the standards they must meet; give them the opportunity to improve; and inform them of the consequences if they do not. Occasionally, an employee can be terminated for cause based on a single significant incident. More often, however, termination for cause arises from a series of repeated failings. In the case of the latter, it is essential that employers be able to demonstrate that they gave an employee incrementally more serious disciplines and sought ways to improve their performance. For both of these examples, documentation with concrete examples is key. Progressive discipline most often means initially giving an employee a verbal warning, then a written one, followed by a suspension and finally termination in response to repeated inadequacies in their performance. A Performance Improvement Plan (PIP) is intended to ensure that the employee is aware of their job’s expectations, their failure to meet them, and gives them explicit, achievable goals with a clear timeline for them to improve their performance. 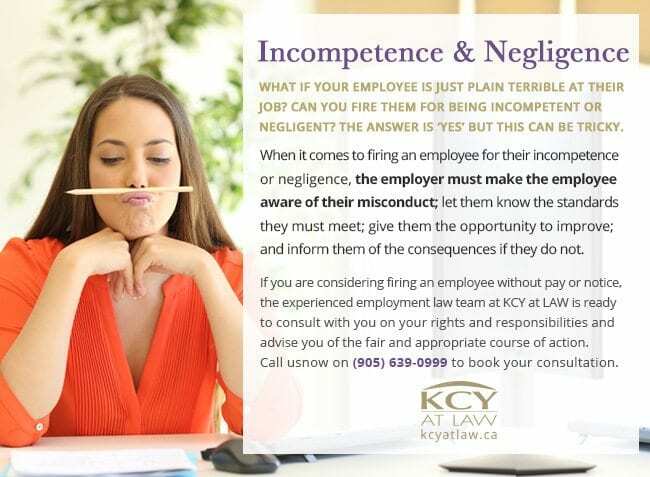 If you are considering firing an employee without pay or notice, the experienced employment law team at KCY at LAW is ready to consult with you on your rights and responsibilities and advise you of the fair and appropriate course of action. Call us now on (905) 639-0999 or contact us online for more info!